"Trying to create tough machines"
At the Machinery Business Unit, we aim to develop, manufacture and sell long-lasting and tough machines that live up to customer expectation and confidence. 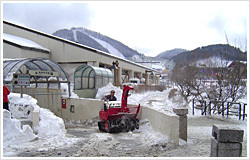 We promote the sales of our products not only in Japan but also in Europe and Asia. Our snowblowers have been delivered also to the Antarctic observation bases of different countries and the Santa Claus Village in Finland. Aiming to win customer's trust through sales, maintenance and repair, we act as a pipeline to the product development and manufacturing departments. We accept and place orders for products and send spare parts. We aim to send 100% of the ordered parts immediately after accepting orders so as not to cause inconvenience to the customer in the event of a sudden breakdown. We extend technical guidance on products. 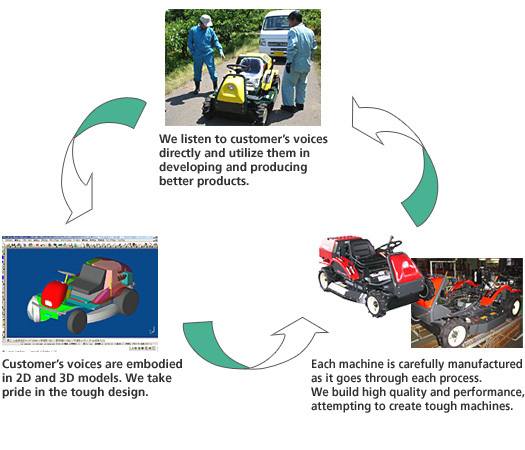 We make full use of 2D and 3D CAD for the research and development of tough products in compliance with market needs. We are engaged in the research and development of control systems that will help the customers use our tough products easily. We thoroughly implement "one-piece-at-a-time" production in all the processes with the motto of "Incorporating customer's voices into shopfloor operations". Each product is made with attention to every detail. We make full use of machining centers to supply high-precision parts, brushing up our skills every day. An original automatic welding system has been adopted. We aim to produce highly durable and tough welded parts by making an effective use of human sensitivity and precision of robotics. The paint dosage as well as the preliminary process and subsequent drying process are carefully controlled to perform high-quality painting. As powder coating is employed, the painted surface has an outstanding toughness. Each operator has a high quality consciousness and carefully performs all the assembly steps to complete products.